Although ear studs were apparently less common than a bauletto earrings [1991.75.13.a-b], pictorial representations indicate that they were popular in Etruria during the 6th century BCE. Actual examples, however, are as rare as they are in Greece, where the type seems to have originated, as evidenced by their frequent representation on statues, in vase painting, and on coins. Ear studs consist of a disk, varying in diameter from two to six centimeters, with a hollow tube - usually of silver - projecting from the back. A corresponding rear piece has a narrower tube that fits into the one on the frontal disk. 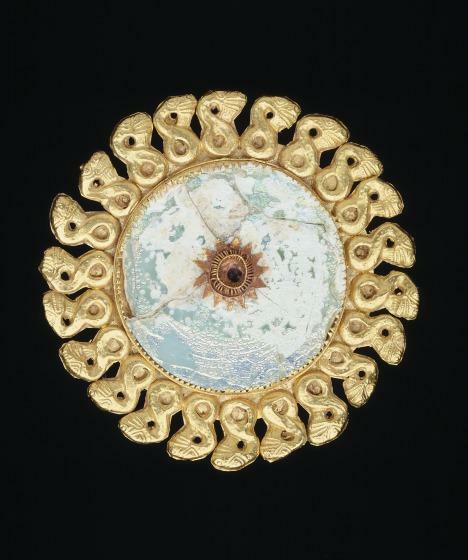 This stud is an unusual example, consisting of a gold frame of stylized snakes around a central glass disk. 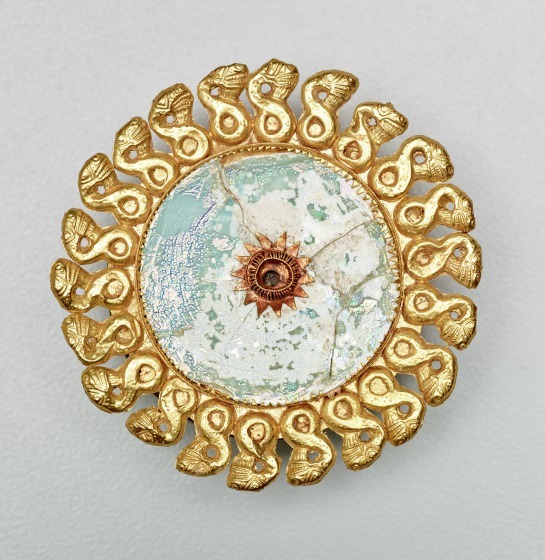 Although the use of glass in Etruscan jewelry is extremely rare, the piece is not the only one in the collection to incorporate a glass element (1991.75.21). Here a plain white glass disk is mounted in a gold setting and held by a serrated border. The decorative frame attached to this setting is embossed in a fringelike border of writhing snakes. A central hole, surrounded by a gold wire coiled in a spiral, holds a tube that joins the front of the ear stud to a silver supporting disk. The composition recalls the aegis of the goddess Athena, a breastplate fringed with writhing snakes. The glass is broken; otherwise the stud is in very good condition. 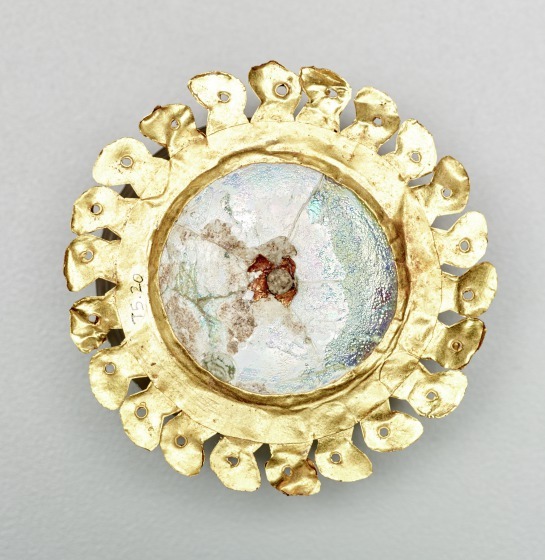 Barbara Deppert-Lippitz, Ancient Gold Jewelry at the Dallas Museum of Art (Dallas: Dallas Museum of Art in association with the University of Washington Press, 1996), 37; 125.